Love your Zelf! Meet The Zelfs, colourful creatures with wacky hair! Fancy ‘yourzelf’ a curl or a crimp? This Venus Flytrap Spin Salon is the place to primp! It includes lots of hair accessories, twirl and swirl your Zelf a good hair day! Includes exclusive Tressa medium size Zelf and a range of hair acessories! One supplied; Styles may vary; Size H25, W34, D12.5cm; For ages 5 years and over; EAN: 630996553053. WARNING(S): Not suitable for children under 3 years old. This toy costs approximately £15.99 (for the latest and best prices make sure you check our retailer list for the Zelfs Venus Flytrap Hair Salon Playset above). 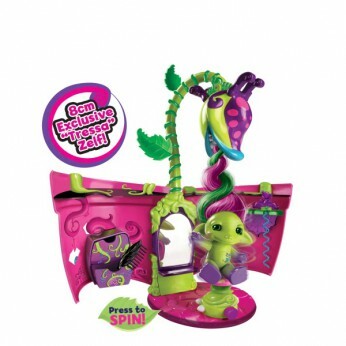 In our review of Zelfs Venus Flytrap Hair Salon Playset we classed it as being suitable for ages 3 years, 4 years, 5 years but recommend you check the manufacturer specific advice before purchasing.